As WearCheck’s footprint extends across many African borders, we encounter countries where English is not the predominant business language, and as part of our good business practice ethic, we do what we can to facilitate effective communication with our customers. To this end, we have recreated our oil sample test kits – originally only available in English – to be available in both Portuguese and French as well. This means that automotive/industrial oil, coolant, fuel, gas engine and aircraft sampling kits are now available in three languages. The sampling kits look exactly the same as before, with the exception of the automotive/industrial sub-form, which now incorporates a tick-box section for component selection. Language preference is set at the customer contact level, thereby allowing different contacts, within the same organisation, the option of receiving reports in each person’s preferred language of the three available. 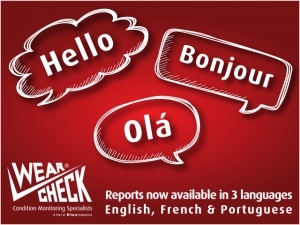 Reports are viewed on the WearCheck Online system which appears in English, French or Portuguese, depending on customer’s requirements. In fact, all WearCheck Online functions, such as emailing, label printing, severity reporting, problem type grouping and so forth, are available in English, French and Portuguese. Cummins Angola, as well as being WearCheck agents, were also our first foreign language customer. Did you know that some of our most popular Technical Bulletin titles are now available online in French and in Portuguese? The documents are on the WearCheck website, and can be downloaded as pdf files, for FREE! Newly-translated Technical Bulletin titles are uploaded regularly, so make sure you keep checking to get them all. WearCheck technical manager Steven Lumley shows off some of the translated Technical Bulletins.